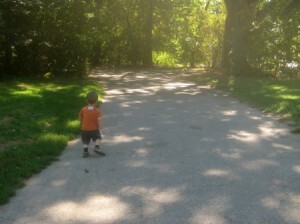 Maria Montessori wrote, "Follow the child"; that's my philosophy, too! What's yours? One morning while dropping off my son at day care (he was then eighteen months old), I heard the mother of a three- or four-year-old boy say a dirty word: homework — as in, her pre-K-aged son had “done his homework.” Though I never had any doubts about the warmth of the care my son was receiving at this family day care center, I did have some reservations about the curriculum for the older children (work on computers, for example); once I heard the word homework I was certain that we would be looking for a different preschool for our little Critter. Education should nurture children’s natural curiosity rather than be a source of anxiety. Education should be responsive to the questions and interests of children and should not be constituted solely of assignments given by adults. Education should be developmentally appropriate. As my husband and I sought a new placement for the Critter (who now attends a Montessori preschool three days each week), it became apparent that my husband had no strong opinions about the education of children. I started to think about how those who have not been educated to be an educator can discover their own philosophy of education. What is a “philosophy of education”? The word philosophy might suggest something abstruse or difficult, but really all that I am talking about is a statement of your beliefs about the purposes of education. And, because your philosophy of education is a reflection of your values and worldview, it is by necessity unique to you. There is no one philosophy of education. Why should one have a philosophy of education? Is this school right for my child? Is unschooling right for my child? Why am I unhappy with what seems to be going on in my child’s classroom right now? What should I be sure to discuss in my next conference with my child’s teachers? How do I develop or choose a homeschooling curriculum for my child? OK then, how do I get one? One of course does not “get” a philosophy of education as one gets milk and eggs from the store; it is rather a process of discovering and clarifying the beliefs you already hold. There are several ways to do so. Reflect on the experiences of your own education. Who were your most beloved teachers, and why? In what kinds of learning experiences did you find joy — and in what did you find frustration? How have you been able to break through frustration to new understanding — and when was the frustration just frustrating, nothing more? Though it is of course important to recognize that your child is a different person from you — and, in some areas at least, most likely a different kind of learner than you — your philosophy of education is likely to begin with your own experiences, both the good and the bad. Though my thinking about homework, for example, has been informed by my experiences as a teacher and my reading of Sara Bennett’s now-defunct blog, Stop Homework, my feelings about homework are certainly based on my own experiences with it as overwhelming and stifling. Envision the adult you hope your child will become. In my methods classes in graduate school, we learned to plan backward: to begin the development of curricula and lessons with a statement of what students should understand or be able to do by the end of the course of instruction, and then plan toward that end. What end do you have in mind for your child’s education? For example, I want the Critter to grow up to be a lifelong learner — in other words, the end I have in mind is that there will be no end to his education! And so, working backward from this vision, I believe that his education should foster his curiosity and nurture his ability to recognize and define his own questions as well as to seek and find answers to them. Create a list or commonplace book of inspiring readings and quotations on education. We often speak about children and young people in our society as “the future.” What do we imply by such a belief? Preservation, or change? Ensuring that children and young people can live in the world as it is, or ensuring the skills, knowledge, and dispositions that will enable them to change the world, to construct on their terms new possibilities? The chapter is called “Toward Large Purposes”; in it, Perrone urges teachers to think deeply about purposes, an endeavor that may seem to some to be “too philosophical, too abstract, [or] too far removed.” Perrone argues that it is not. Our purposes are first things, he says, and without attending to these things, “we are more often preoccupied with simply getting through the days and weeks.” Indeed. An education shouldn’t be something to be gotten through or (even worse!) endured. What, then, should it be? What are the days and weeks — and months and years — of learning for? Your answer to these questions is your philosophy of education. 19 Responses to What’s Your Philosophy of Education? This is such important food for thought! I also took a Masters degree program for teaching ELA to secondary students, and I wish they had given us this assignment. I still have a young baby, but I’ll be thinking of this starting now. Thanks! Thank you! And honestly, the philosophy statement I ended up writing for grad school really was very specific to teaching ELA to secondary students, so I’ve had to broaden my thinking since then. What a great post. I can join the chorus of those who did graduate work in education, although I was looking at the university level. I particularly like this bit: Our purposes are first things, he says, and without attending to these things, “we are more often preoccupied with simply getting through the days and weeks.” I think that most of us are called back to “getting through” by the pressures of life, and attending to purpose needs to be a guiding idea to help break out of that mold. That Perrone essay is so, so good. I read it several times while working on this post. I think the best education is appropriate developmentally, stimulates curiousity, and rather than teaching the child what to think it helps them to learn how to think.. Those are my educational hopes for my children. I’d like them to view the world with adequate awe and curiousity and have the confidence in their own ability to think so that they are comfortable exploring the challenging the world. I love the word “awe”: yes! I’ve never really thought about my personal education philosophy, but I love how you’ve put it. Learning is FUN and I desperately want my children to know and feel that. Learning can be uncomfortable, too, I think—though certainly something is wrong if it’s nothing but discomfort all of the time. I hope that my son continues to enjoy learning as much as he does at his school now. I think philosophy of education is similar to yours. It should follow the child and stimulate him or her to learn for him/herself and for pleasure. There is no end point. My children are 6, 8 and 10 years old. The school they are at has students fomr ages 4-18. Their philosphy is that they are teaching the whole child for a whole life, not just to get them to a top university. That school sounds marvelous! When I was in graduate school, one of my teachers worked at a school that had fifth through eighth graders in classes together. At the time, it sounded totally weird to me, whereas now, I’d love to find something like that for my son. The way that you describe your philosophy for teaching high school science, it sounds pretty applicable for young children! Thank you for this great post, Rachael! Having been a Montessori teacher before becoming a parent, I have caught myself several times doing things because they’re ‘the Montessori way,’ without having thought through them and whether they’re what I think is right for *my* daughter. It’s really important to consider what our goals are with any parenting practice – thanks for this great reminder! Ha, thanks to you for your reminder, Melissa! It’s funny, because I’ve tended to envy those trained in Montessori methods, because it seems they have a ready-made philosophy of education. But really, any philosophy must be examined in relation to one’s own values and the needs of one’s own family. I have enrolled my 4yo daughter in a homelearning program at a local school, where she can optionally attend two days a week and learn at home the rest of the time. Homelearning had been a rather theoretical thing for a long time and now the practical considerations of educational philosophy and the details of curriculum are becoming more urgent. Thanks for some great food for thought, I am going to track down Perrone’s book. I hope that the Perrone book is helpful, if you do find it. My sense, though, is that it is really focused on the work of teachers in schools. The first chapter, which is all that I have or have read, is marvelous for anyone, I think, because Perrone asks so many good questions. I have always been concerned about the education system in this country. It’s so robotic, how do have we done it so long? I totally agree with you – basically, you need to care enough to be involved in your child’s education & reflect upon these questions you raised. It’s a great challenge to pose to parents who may not have considered what pressures their children face in their education system. Sad as it is to say, “robotic” is a good word to describe some of what happens in schools today—though certainly not in all of them, nor all of the time. This interview with Linda Darling-Hammond (who I wish were our Secretary of Education—she did advise Obama during his campaign) explains the factory model according to which most U.S. high schools have functioned for about a century. Reform efforts are underway, though, and I hope that they spread. I’m a big believer in homeschooling, despite being a teacher in a private school. People ask me how my children will be able to function in the world if I homeschool them — because the world is hard, mean, scary, and has unfair expectations, just like schools sometimes do. But I believe they will be more likely to work to change the world if they are able to recognize what is out of place with it, if they are raised with an environment that is gentle and freeing. My husband was homeschooled his whole life (I was only part of the time) and sometimes I’m frustrated with his refusal to accept “the way things are” when things don’t work as they should. But over time, I’ve seen him work to change things that don’t make sense. He never just accepts that things have to be the way they are. It’s led to him seeking and achieving positions of leadership, simply because he’s on a mission to change things and people sign onto that. I admire that ability in him, and I want to foster it in my child(ren).